Children with brains and minds forever changed by psychiatric drugs. Children who will never know who they might have become. Childhoods stolen by false drug-company promises. In the last two decades the psychiatric diagnosing and drugging of America’s children has skyrocketed. Even children who aren’t taking drugs will know other children who are on psychiatric prescriptions; they are often in a stupor that’s obvious to everyone but their doctors. Children are being lied to that they have broken brains, brains with biochemical imbalances, and that they need drugs for the rest of their lives. Instead of receiving the help they need to learn to control their behaviors, they are told to rely on drugs. When the pills fail them, they are told it’s their brain disorder. Then come more diagnoses, more psychiatric drugs, and a lifetime never fulfilled. 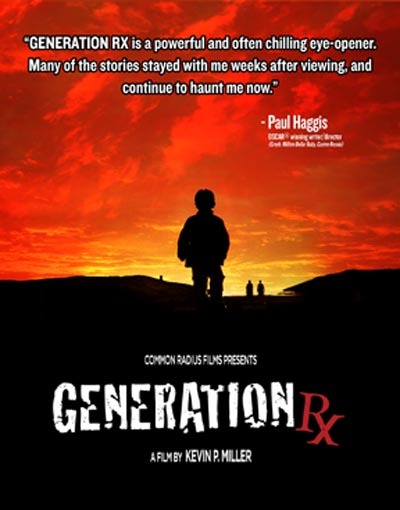 In his groundbreaking film, Generation Rx, Kevin Miller told the story of the first generation of children psychiatric diagnosed and drugged. These children have grown up and they are sending letters to Kevin. The letters come from every state from children and teens, and children now grown into young adulthood. Although only in their twenties, some have been on psychiatric drugs for two decades. Psychiatry stole their childhoods and damaged their lives. Now Mr. Miller is meeting with these letter writers. Through his new film, he is telling their stories. The film is called Letters from Generation Rx. You will never think about children and psychiatry in the same way after seeing this film.